A beautiful addition to the wedding decor or that special event! 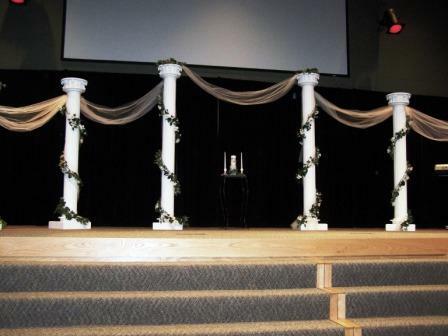 The wedding columns are built strong and resistant to chips, scratches and cracks. The shaft or pillar of the columns are fluted 6" PVC. And the base and capitals are solid hardwood making the columns strong and durble yet lightweight. The 14 in. molded base provides superior stability and balance. They are one time project for a family member’s wedding. Each one hand made in my woodshop. All 8 columns only $1450.00! Careful delivery or shipping is available for a fee.